Be whisked away to experience unforgettable flavor and color combinations that are out of this world! To maintain their magical glow, unicorns must stick to a diet of sugar, sparkle, and everything rainbow! Take a peek into their mythical world with this cookbook—filled with more than 80 colorful cakes, cookies, and fantastical treats. Learn how to turn everyday desserts into rainbow delights and add a whimsical touch to your table. Cupcakes that have rainbows bursting out from the center! Prepare to be inspired and for your tummy to rumble. Vibrant photography and simple recipes combine to create a magical reading and baking experience! Not only will readers create beautiful desserts, they’ll also acquire a fresh set of baking skills. The easy-to-follow instructions and tips ensure that both novice and expert bakers achieve perfect results every time—you’ll learn how to bake the perfect vanilla cake with buttercream, then transform it into a rainbow! These recipes use classic techniques and ingredients, creating a delicious base for readers to experiment with and to create beautiful, unicorn-approved results. 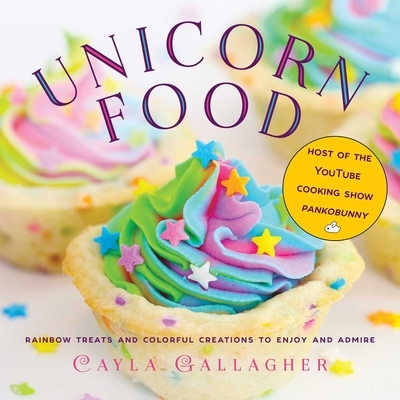 Cayla Gallagher is the host and creator of the YouTube channel pankobunny, an online cooking show where she creates weekly tutorials, teaching her subscribers how to turn everyday recipes into “edible cuteness”—colorful, eye-catching treats! With an audience of more than 300,000 followers across her social media platforms and more than 300 million views on Facebook, she strives to bring amusement and creativity to dinner tables all over the world. She was named one of Canada’s next up- and- coming YouTube stars in 2016, and also sells pankobunny-themed treats on her Etsy shop. “Innovative and adorable culinary creations."